The old Methodist Church was built in 1791 on part of Mr Adcock's garden, in the lane behind the Griffin Inn. 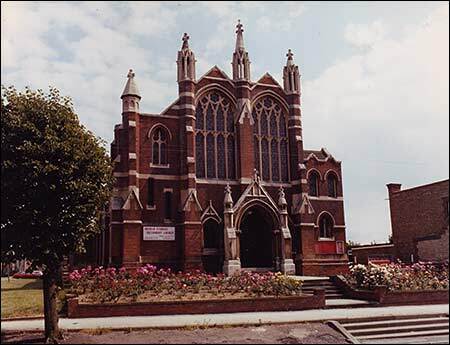 The new church pictured right was built by Robert Marriott in 1903, on land purchased in 1897 from G C W Fitzwilliam. During WWII the old church building was used as the Home Guard headquarters, and was demolished soon after the war. The Higham Ferrers Methodist Circuit registers date back to 1813 and covered a wide area where the borders of Northamptonshire, Bedfordshire and Huntingdonshire come together. As numbers of Methodists grew in each village, so the village would start its own church. The registers used to record the events, at first covered the whole Circuit but as new churches were built and started their own registers, eventually only the Higham Ferrers events were recorded in the books. Our “Rushden Research” Group has recently completed the transcription of the Higham Ferrers Circuit and the following books which contain only the Higham Ferrers records, together with the records kept at Rushden Methodist Church since it opened in 1889, as both the churches are now combined into the Hope Methodist Church. They are currently fundraising to build a new church on the site of the Higham Ferrers Church (in 2007). It will then serve both parishes and their events will once again be recorded together. In 1822 Jane Duncombe, who kept a school. In 1822 Elizabeth Johnson, to use her premises. 1822 - A barn was authorised, but no occupier or owner named. In 1826 Elizabeth Sharman, to use her premises. In 1827 David Felce, to use his premises. In 1832 Joseph Cox, to use his premises. In 1850 A Wesleyan Methodist Chapel and schoolroom. In 1851 Joseph Lamb, to use a room at The Queen’s Head Inn.